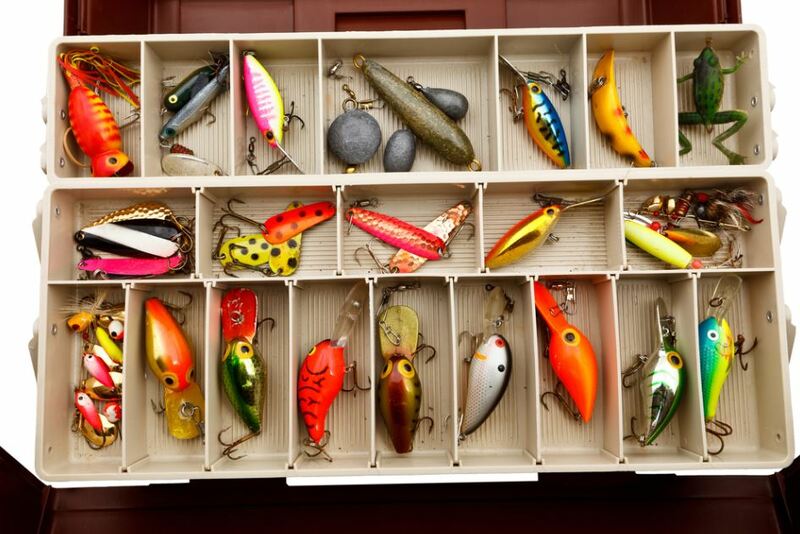 There are very many varieties of fishing lures available on the market. They have grown in popularity primarily because they can be reused, as a result of being artificial. This makes them cheaper to use in the long run as compared to live baits, which are usually eaten off and therefore used only once. They are designed in one of two ways: to imitate smaller fish, larvae or insects, which is food for fish or colorful with reflective elements to attract the fish. Jigs are probably the most versatile lures because they can be used to catch most types of fish. They have weighted lead heads and are available in various sizes and colors. They also have colored tails, which are made of feathers, rubber, plastic or animal hair. There is a variety of jigs that include swim jigs, bladed jigs and football jigs, with each having different uses. Bladed and swim jigs are good at catching fast moving fish while football jigs are good at catching slow moving fish. They are mostly used to fish for large fresh water fish such as bass because the weighted head sinks them down to the bottom (where large fish are located) and the irregular vertical motion of the jig attracts them to it. These lures are ideal for beginner anglers because they attract fish on their own. They have spinning blades around their metallic shafts that spin whenever the lure is dragged on water. This spinning causes its reflective surface to produce light reflections that attract the fish. It also creates sounds and vibrations, which are sensed by the fish using their lateral lines and because of this, they can be used in all water conditions, including in muddy or stained water. They imitate the swimming of fish, which baits predatory fish such as pike and bass. These are curved metallic lures that have a hook on one end and a loop on the other end with no distinct body shape. They are easy to use and thus very popular among many anglers. Majority of them have 2 different sides: one being very colorful and the other having a reflective, metallic surface. They move in a wobbling motion when dragged through water, making them appear as injured fish, which is very attractive to predatory fish. Plastic baits include a wide variety of fishing lures. Some resemble animals such as frogs, worms, lizards and crawfish among many others while others have no distinct shape (creature baits). They are usually soft and multi-colored, which provides great visuals for hungry fish. Their soft plastic covers encourage fish to bite into them longer because they feel like actual flesh and this gives the angler plenty of time to set the hook. They are ideal for catching most types of fish, especially during peak feeding times such as during the summer period. These are the most commonly used lures because they are the best at imitating bait fish. They come in various shapes, sizes and colors and are classified into two: lipped and lip-less. Lipped baits have a bill on the front and 2 hooks at the bottom. The size of the bill (lip) determines the depth the lure can reach and also gives it its wiggling action. They include lures such as rip baits, wake baits and minnows, which are usually sold as discount fishing lures, meaning you get plenty of them at a very good price. Lip-less baits have the same design as lipped baits but have no diving lips and get their wiggling action from the imbalances caused by their internal body weight and body design. Their ability to sink to different water levels as well as their different sizes make them ideal for catching a wide variety of big and small fish, making them the holy grail of fishing. These are just the main types of fishing lures. Some of their variations do exist (such as jerk baits, plugs, swim baits etc.) but these are specifically picked out by experienced anglers who prefer them for very specific purposes. As you continue gaining experience in this sport, the best thing would be to try out as many lures as possible so as to find which is best for your type of fishing.